2. incapacity or indisposition to bear or endure the Word of God: intolerance to Christianity. Homosexual activists vandalized a Chick-fil-A in Torrance, California. The graffiti showed a cow with the writing "Tastes like hate." Homosexual LA artist, Manny Castro, has come forward as the vandal. Castro has been pretty open about his actions and has celebrated with other radical activists. (CNSNews.com) – Boko Haram is demanding that Nigeria’s Christian president convert to Islam or resign, a stance that again calls into question the Obama administration’s playing down of religion as the primary motivation for the radical group. 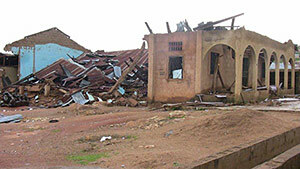 In northern Nigeria, radical Muslims of the Boko Haram sect have chosen Sunday as their favored day for bombing churches. Inviting an enemy to convert to Islam or face the consequences is a longstanding tradition in Islam, modeled on the example set by the religion’s seventh century prophet. Boko Haram has claimed responsibility for dozens of deadly bombings and other attacks, mostly targeting Christians in northern parts of Africa’s most populous country. 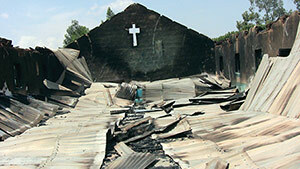 It has vowed to cleanse northern Nigeria of Christians. Following photo is linked to an article posted by this author in December of 2008. Please read the article in its entirety at the link below. The times online.co.uk article linked to the post has been removed, but there are enough quotes from the Times article to get the full intent of the message. Even though the above article was posted in 2008, there still seems to be some strong similarities in this day we are living. The spirit that is found in both the radical homosexual and radical Islamist has the same author (origin) and is without question, an anti-Christ spirit. Opposition from this spirit is vehement and openly defiant when it encounters the unadulterated teaching of God’s word. Quran Teachings- “A religion of peace”, quite the contrary. A religion of hate and destruction! While the spirit in the radical homosexual is akin to this Islamic spirit it is somewhat different in its mode of operation. Like the Islamic spirit, the attacks against the clear teaching of God’s word is very vocal and on some occasions can manifest rather violent tendencies against those who follow Jesus. Ironic though, this homosexual spirit is seemingly tight lipped concerning the destructive practices of the Islamic religion. Contrast the teaching of Jesus Christ with Islam. Christ’s message was immersed in mercy and grace. Jesus was a ‘friend of sinners’, offering a message of hope, peace and reconciliation to God, while Islam’s god decries not only the Christian faith, but the homosexual alike and would desire nothing less than total destruction of the both… infidels in the eyes of Islam. How can the homosexual find this attack by Islam any less offensive than the issue of sin propagated in God’s word? The Word of God is the crux of the matter. When one stands upon the clear teaching of God’s holy word, he/she will encounter this radical spirit of opposition. Religion does not like for the word of God to belittle it’s god. The thought that there is one True and Living God and He has denounced (in His word) all other gods as foolish and useless does not set well with other religions. They cannot attack God, so they direct the persecution toward His people. This same anti-Christ (religious) spirit opposed Jesus Christ at every turn. Additional ‘salt in the wound’ is when an individual stands face to face with the same word and find they are dead in their trespasses and sin and in need of a savior. Sin is not a pretty picture and to constantly be reminded by the Word of God, that all have sinned and that the heart is deceitful above all things is desperately wicked, is not palatable to the flesh. We all like to think that we are correct in our thought process. When a man/woman is told that the way that seemeth right unto them is in fact the way of death, the natural tendencies of the human spirit is to resist this truth. For both the radical homosexual and Islamist this kindles the anti-Christ spirit afore mentioned, but for the true follower of Jesus Christ there cannot be a shadow of turning. It has been almost four years since the posting in 2008. Not much has changed. If anything, things have digressed, which are to be expected. It is not enough now that the radical homosexual suppresses the truth of God’s word by their unlawful deeds, but like the radical Islamist, they want to mold the independent thought processes unto their own way of thinking. When it encounters dissension, the attack begins. When the thought process is aligned with the truth of God’s word, the vitriolic attack intensifies. What we seeing in America is a concerted effort from every level of our society to not only stop the mouth of free speech, but to completely remove any hint of God’s word from our society. In other words, the homosexual in essence is attempting to make us more like an Islamic nations. It is rather strange, to see the radical homosexual continue its vehement spirit of opposition against Christianity, while Islam is seemingly receiving a free pass. As the radical homosexual and radical Islamist fight for the thought process of our society, and the both seeking to shut out the Word of God, if Islam prevails, where will this leave the homosexual life style? Envision this new America… No Christian churches or bible book stores or Christian doctrine permeating the radio or television. No need to Google Christianity because there will no Christian churches, only mosque in every town in America with the call to daily prayers vocalized across the airwaves. Oh, and in every town square, a gallows, for non-conforming thinkers. And instead of freedom of speech and independent thinking, Shuria law. You think Chick-fil-A taste like hate… smoke this new America over my friend! What you’ll find is a catch-22 for a hopeless society immersed in darkness, with no Light at the end of the tunnel. The spirit of radical Islam has not changed. It continues its attempt to stop the mouths and the testimony of the people of God. When all measures to force their thought processes to align with Islam fails, the only option left is annihilation. In the most brutal manner, but to my brothers and sisters in Christ, stand firm, for our Lord has already traveled this road and has overcome. We will too! The real problem is God’s word has not changed. A word that is cemented in the righteousness of a Holy, True, and Living God cannot and will not change. His word is the same today, the same yesterday and forever, just like His mercy and forgiveness. It is this same word that has the power to change the spirit of homosexuality and Islam. The Ethiopian can not change the color of his skin nor the leopard his spots, but when a man is born again, he is a new creature in Christ. Old things are passed away and all things shall become new. May you come face to face with Jesus (Yeshua, Isa) and find the peace that surpasses understanding. Merry Christmas….. if God is real, why does He allow His people to be martyred?